The Magnolia stellata buds are about to burst open in Nova Scotia. One tree outside a seniors' home just a block away has shown great growth just over the past week. I imagine in the next few days they will be open and in full glory. Star magnolia literally covered with blooms. 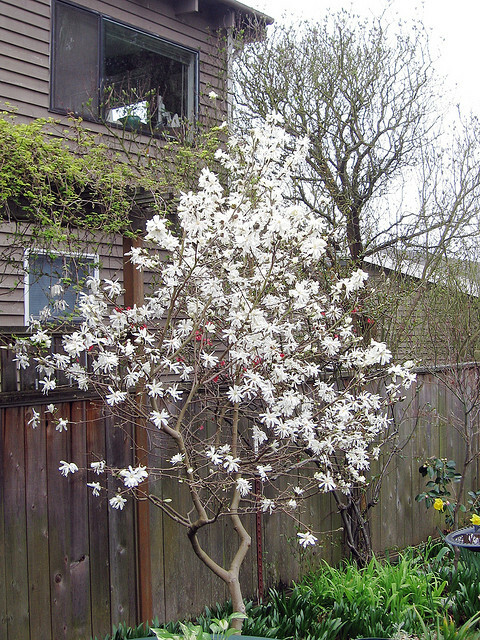 Usually called “star magnolia,” this shrub or small tree is a native to Japan. In spring it bears fairly large, showy flowers before the leaves appear. 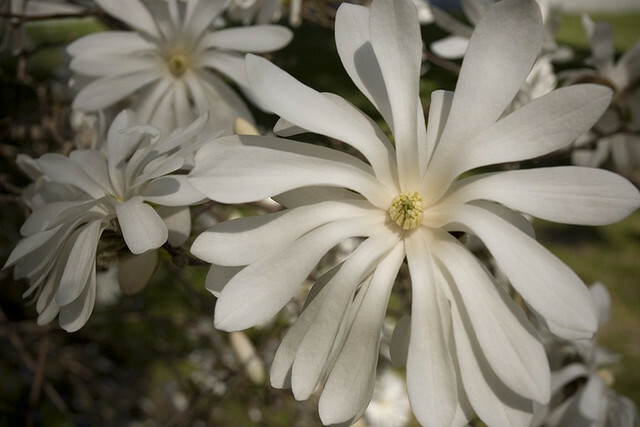 Since its introduction in the mid-1800s star magnolia has become a garden favourite. It is believed to have been introduced to the United Kingdom in the late 1870s, most likely by Charles Maries, while he was collecting plants for Veitch Nurseries. 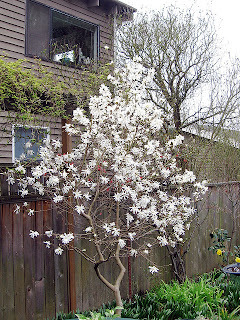 Star magnolia can grow to 4-6 m (12-20’) in height. In Nova Scotia I have yet to see an adult specimen much over 12’. This blooming tree does has the distinction of blooming at a very young age. In fact, there is one just a few blocks away from my home that is blooming at less than 3’ high. Although usually pure white there is some variation in blossom colour as the overnight temperatures when it is preparing to bloom can affect it. That means from year to year your tree can be anywhere from white to light pink. Because the buds develop while it is still cold in Nova Scotia they can be damaged by late spring, heavy frost. The flowers are star-shaped (hence the common name), with many thin petal-like tepals. The leaves open brown-green, turning to dark green as they mature, and yellow before dropping off in autumn. Like other magnolia, the seeds are bright orange, showing as the seed pods split open in late fall. Magnolias can be pruned but only slightly. They dislike disturbance of any kind once they're settled in. If you do feel the need to shape your star magnolia, do it only after the flowers have faded and then only a small bit. Radical pruning will, at best, set your plant back in growth or, at worst, shock it and possibly kill it. Trim only if absolutely necessary. Plants are meant to be wild and free. Let it take its own course to maturity. 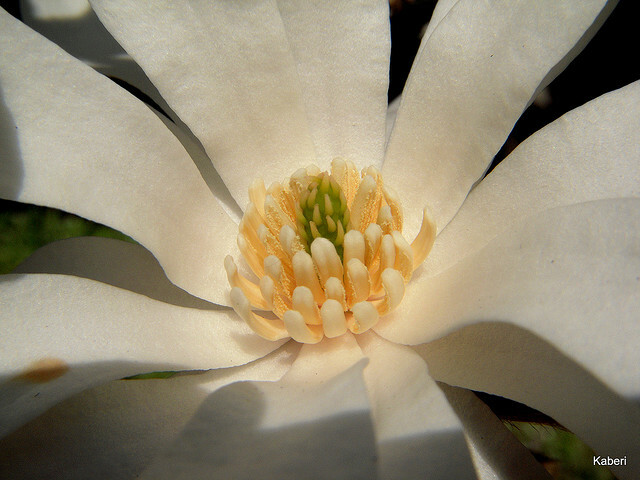 Star magnolia is found growing wild in certain parts of the Ise Bay area of central Honshu in Japan. It grows by streams and in moist, boggy areas. Star magnolias are readily available at major garden centres, and sporadically at some in such places as Walmart, Superstore, Sobeys and Canadian Tire. There are many cultivars. Since garden centres will soon be opening these plants should be difficult to miss. I have to admit this isn’t my favourite magnolia. I tend to lean to the more substantial flowers of saucer magnolia or magnolia seiboldii both of which bloom later. But this is a hardy, dependable little tree that should deserve a place of honour in your garden, preferably within sight of a window where you can enjoy the flowers while sitting inside with a cup of coffee! If you like this post retweet it using the link at top right, or share it using any of the links below. Gardening: Maples are in bloom too!